Thanks to a scheduling issue, I happened to find myself with an extra day and night to spend in Belize following a stay in the town of San Ignacio, about an hour inland from the coast, and a much shorter trip to the Guatemalan border. The purpose of the trip was to enjoy some of the Mayan ruins in the region, as well as some of the national parks and preserves in the area. The four days I spent in San Ignacio were fantastic, and I’d highly recommend visiting, but with an extra day before a return flight from Belize City, I opted to head for some of the country’s blue water and beaches. Belize is home to a handful of islands located in relatively close proximity to the mainland coast, amongst which, San Pedro on Ambergris Caye is one of the more popular options. I looked at a variety of options on other islands and further down the coast, but the majority were either prohibitively expensive, cheap enough to make me nervous, or simply too difficult to get to and from quickly on a limited schedule. We ended up going with Mahogany Bay, a recently constructed Hilton property. Our stay at Hilton’s Mahogany Bay property in San Pedro, Belize happened to be shortly following its opening, and before a few of the finishing touches had been placed. The hotel was brand new, and very nice, but it seems as though the staff was still working out a few kinks here and there. One of those kinks seemed to be transportation between the island’s tiny airport and the resort itself, which was a 5 or 10 minute drive. Transportation is supposed to be provided by the resort, and despite providing the hotel with the details of my arrival, no one was present to pick me up at the airport when I landed. Fortunately, the airport’s small staff was very friendly, and within a few minutes, they had offered to get in touch with the hotel for me to sort out my transportation. The situation was ultimately resolved, and the only inconvenience was that I had to sit around for a half hour or so before my ride showed up. It really wasn’t a big deal, but I do wonder if it would’ve been more difficult to resolve if the airport staff hadn’t been so helpful. The hotel itself is not on the beach, which is a little surprising considering the small size of the island, but it does offer a great pool, and access to a private beach club, which appears to be on its own tiny island located a short boat ride away. You simply let the staff know when you would like to depart and return, and the rest is as simple as getting on the boat at the proscribed time. The boat that shuttles guests to and from the beach club departs from a dock right in the middle of the hotel grounds via a canal, and towels are provided. There were only two other guests at the beach club when we elected to go, and the boat even altered its schedule to allow us to leave at a different time due to a snorkeling appointment we had made. I’d give the beach club itself pretty high marks. It seems to be the only thing on the tiny island it’s located on, so the only people you’ll run into are other guests of the hotel. It has a bar with a small kitchen for food orders, umbrellas, beach chairs, paddle boards, all with excellent service from the staff. 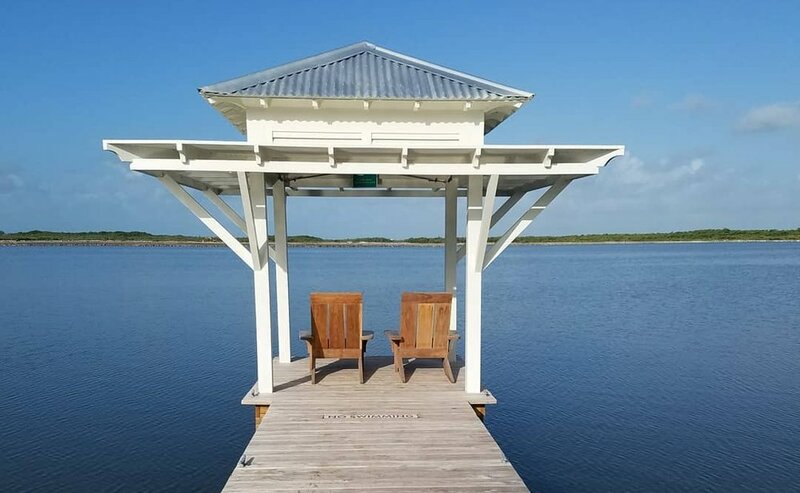 There are also cabana structures built above the water in the shallow area a few yards off shore, although they do cost money to reserve and use. Keeping in mind the beach and island setting, the food and beverages were quite good and reasonably priced relative to what I’d normally expect from a hotel or resort. The biggest drawback of this set up is obviously that you have to make a little effort to get there, and that you’d probably run up a pretty substantial bill if you hung out there eating and drinking all day, as only water is complementary. We did run into some other guests who had brought in some of their own alcohol to consume while at the beach club. The staff didn’t seem to notice or care, but I’m not sure what the official policy is – the whole set up is pretty laid back. While the hotel itself isn’t located on the beach, it does offer bicycles and golf carts for rent, and a local shuttle, so accessing most of the island’s beaches wouldn’t be difficult, especially considering one is located right across the road from the entrance, if you can brave the long driveway. We did venture across the road to the beach for a snorkeling tour, and the hotel staff was more than happy to take us the short distance in a golf cart, but I’m not sure if this was because we had arranged the tour through the hotel, or because they’ll actually take you anywhere you want to go. The Mahogany Bay does of course have a couple of restaurants and bars incorporated into it, but they are pretty typical of what you’d expect from a hotel or resort. I thought one of best aspects of the hotel was the other food vendors that had small establishments on the premises. It would probably be a pretty long walk if you wanted to go into town on foot for some food or drinks, so in addition to the transportation options provided, the hotel has also built several individual structures that function as food stalls offering a variety of dishes available for purchase. During our stay, the buildings were occupied by vendors selling donuts, hot dogs, wings, tacos, sandwiches, and one or two others that I can’t recall. I’d go so far as to say the food from these vendors was pretty cheap, and although I only sampled the tacos and wings, extremely good. It was fantastic to have access to a variety of cheap food options on the grounds of the resort, and is something I’d look forward to if I returned.